Wow! 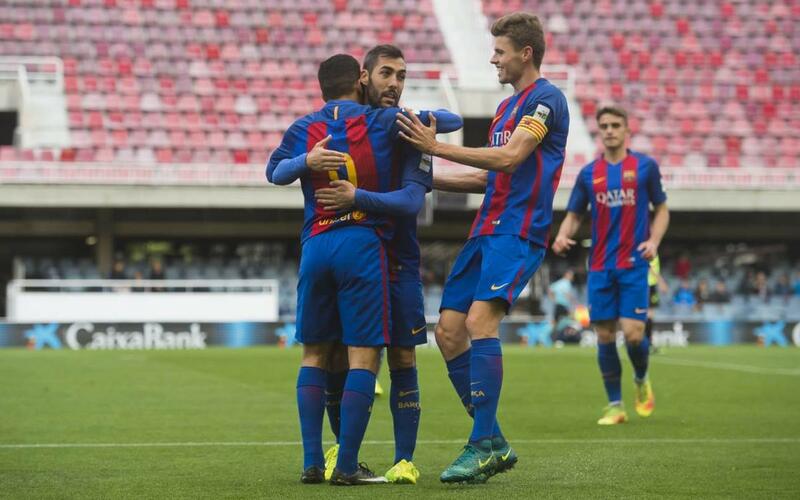 Barça B blasted their way on Saturday afternoon to the biggest win in their history, 12-0 against bottom-of-the-table Eldense. The reserves were already a staggering eight goals to the good at half time and added another four in the second half, and that was even without the suspended Palencia or the injured Mujica, Moisés, Jose Suárez and Varo, as well as Carles Aleñá being away on first team duty! Barça B led with just their second shot on goal, converted by Romera, and Jesús Alfaro soon doubled the early lead. Then the floodgates opened. Carbonell made it three, Gumbau stuck away a penalty, Romera added his second and then Alfaro put away for the second time as well. There was still time for both Romera and Alfaro to round off hat-tricks before the first 45 minutes were up, and the second half was just about finding out whether Barça B could make it into double figures. There didn’t seem to be much doubt that that was going to happen after Perea got off the mark almost immediately after the ball started rolling again, but it would actually take a whole half hour before the ball was in the visiting net again. The honour fell to substitute Kaptoum before another of the replacements, Cardona, made it 11-0 and Abeledo clocked up the twelfth of an amazing game in injury time – thus equalling the highest ever win in this division and ensuring that the B team will spend another week at the top of the table.